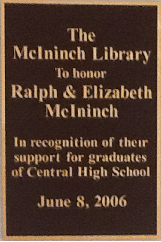 The McIninch Library at Central High School takes photographs for and prints the Identification Cards that students can use for lunch, for getting into Central events, for proving their age, etc. Every student coming in as a Freshman at the beginning of the year, or transferring in during the school year, is entitled to one free ID card. After that, per District policy, there is a replacement fee for lost ID cards. On average, the Library at Central High School produces a total of over 1,000 student ID cards per year. After the Freshmen and transfer student IDs are done at the beginning of the year, typically the library prints between three and five replacements cards every school day. At Central High School, students may still check out books even if they do not have a Central Student ID Card with them. The Destiny Library Manager is linked to the Aspen Student Information System. With this partnership, the student's photograph is shown when he or she is checking out books. This authenticates the student, so the use of the ID card is optional. Also, at Central High School, past practice has been that if a student receives Free or Reduced lunch, then the cost for the first replacement card, for each school year, is $5 instead of $10. Subsequent replacement cards would be $10. 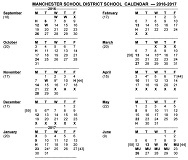 For information on how to use the student ID card in the cafeteria, please ask in Guidance or see the Manchester School District website, under the 'For Parents' section. Thank you.